The name is almost larger than this little oratorio tucked away in a corner of Campo San Angelo. It seems you must have luck on your side to find it open. 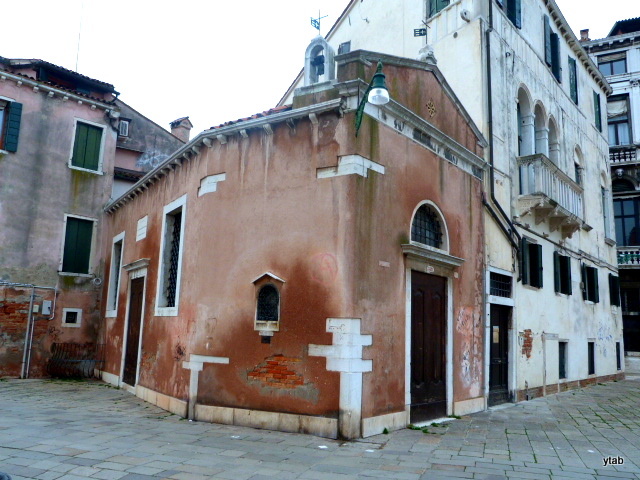 The church of Sant’Angelo the Lame (Zoppi) was founded in the 10th century, and was associated with a confraternity that cared for disabled sailors and which provided a dowry of 10 ducats on the occasion of the marriage of a daughter of a member. The church was demolished by the Austrians in 1837, leaving only the oratorio and convent. 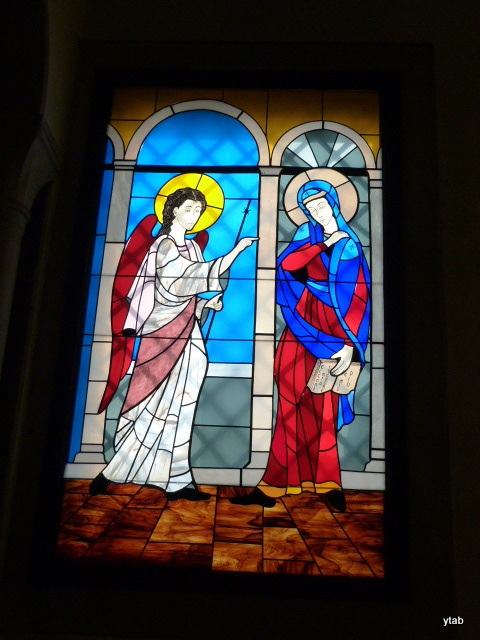 The interior of the oratorio invites a quiet stay for prayer or reflection. 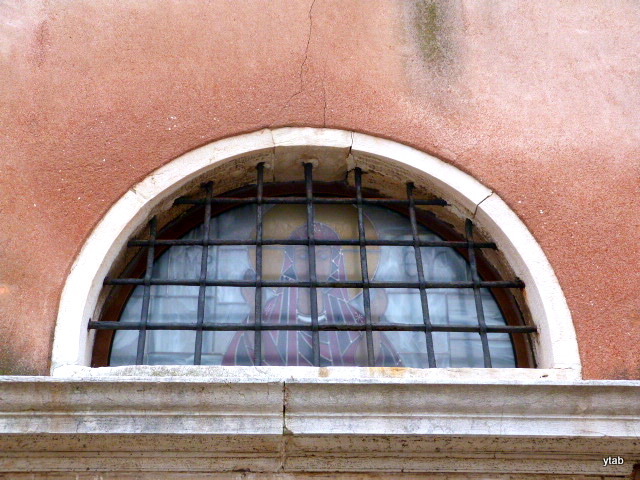 A statue from the 1800s, of San Antonio di Padova is found to your right as you enter the side door. 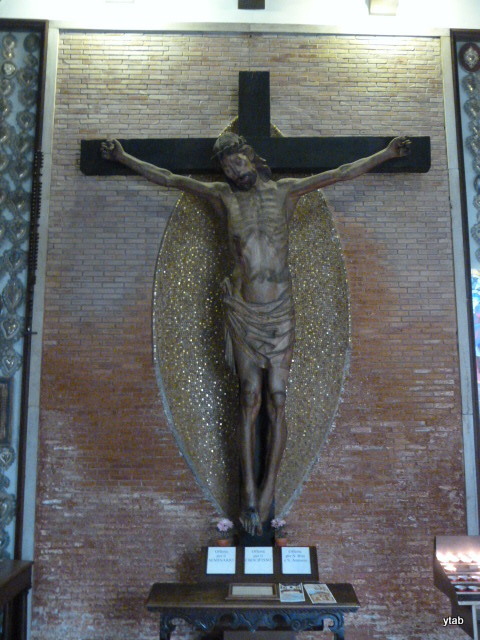 A wooden crucifix from the 1500s hangs between many votive offerings. 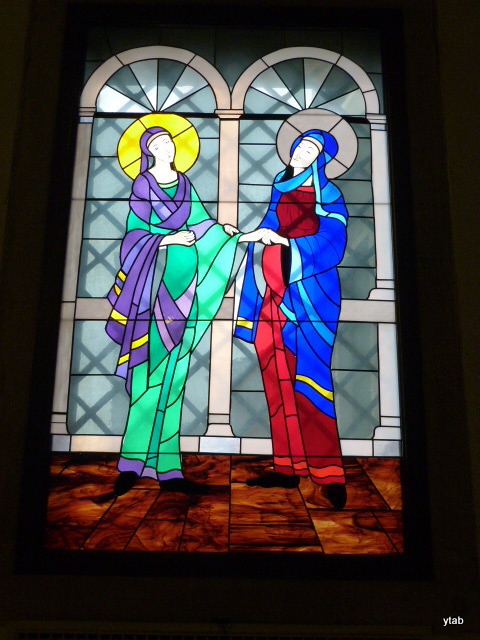 Stained glass windows on several walls allow colourful light to enter the oratorio. Doesn’t Joseph look like he’s wondering how he’ll pay the bills, with another mouth to feed? 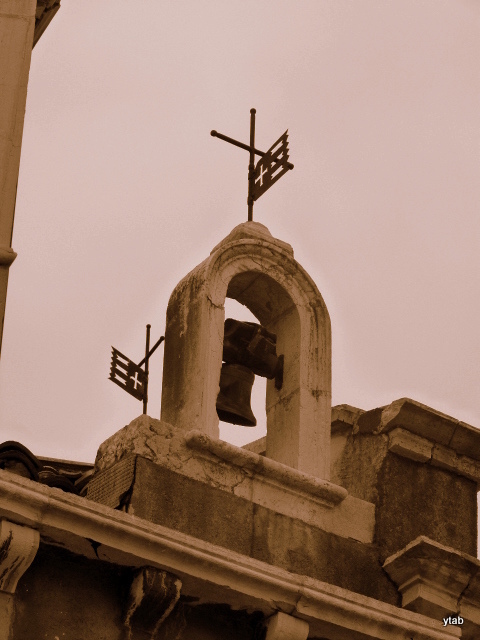 Going back outside, you can admire the little bell on the oratorio roof. 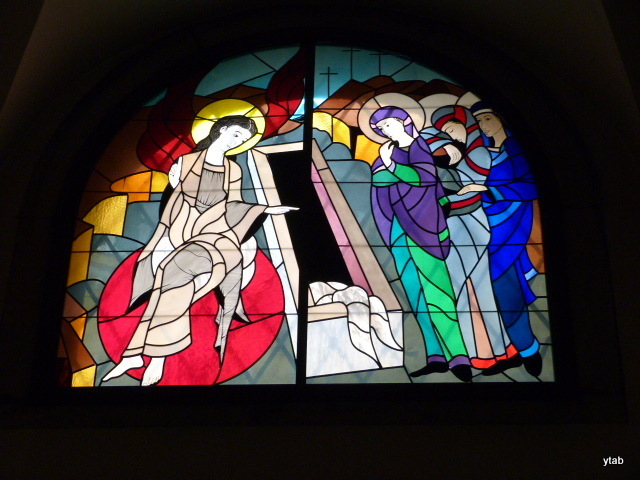 And, part of one of the stained glass windows can be seen from this end of the oratory. It’s often open early in the morning, although I don’t think I’ve seen it open at any other time of day. 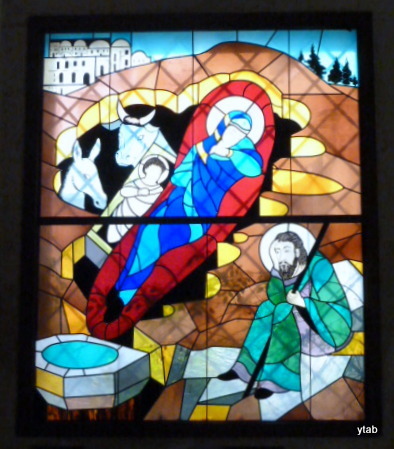 But I don’t remember noticing the stained glass, which looks rather nice (and very modern?) – thanks, must pop back in! I couldn’t find anything about the windows, but they surely are modern. I’d better go back and see if there are any plaques with info about the artist, and the date. It is indeed a lovely little place. Although since that trip had been made to pay taxes and there weren’t deductions in the day St Joseph is probably thinking that besides another mouth to feed there is also the increased tax burden. Lucky you to find it open. As Caroline has said, it seems to be open in the mornings. I’ve never yet had to share the peace with anyone else. Hi Yvonne, I’m getting a personal history lesson..thanks. What a lovely little building. It’s really rugged on the outside, but a little gem on the interior. It would be a lovely place for a small wedding! I should really go back and take photos of the paintings, which are mainly from the 1500s, but some of which are relatively ‘young’. Nice, Thank you! There is a stone plaque set into the pavement of Campo Sant’Angelo opposite the oratorio that marks the location of the earlier, demolished Chiesa. I recommend standing there and thinking about how different the Campo must have been when a reasonably sized edifice stood there! Ciao! You can be sure I’ll do that, Randallo. Ciao!